I first visited Poland 25 years ago with my mother. She was returning to her native city of Krakow for the first time since the end of the Holocaust, in which she lost everything and everyone. Although it retained its old world charm, Krakow was dilapidated, and the worst slums seemed to be in Kazimierz, a district that had once been vividly Jewish. In the intervening years, Communism ended; a new generation born in a free Poland came of age; and in the early 1990s, Steven Spielberg made Schindler's List in Krakow, using Kazimierz as a crucial location to depict its worst moment in history. Ironically, the film is now credited with transforming this area: today, it is filled with Jewish restaurants and shops in addition to the restored Tempel synagogue. And in 1990, an annual festival devoted to something seemingly paradoxical -- Jewish Culture in Krakow -- began. During World War II, the Nazis used the Tempel synagogue as a horse stable. Most of the Jews who lived in this vibrant Polish city were rounded up, locked into a ghetto, and then deported to camps including nearby Plaszow and Auschwitz. It is therefore astounding to listen to a Klezmer tango performed in the synagogue a few nights ago -- part of the 24th Jewish Culture Festival in Krakow. The Tarras Band hails mainly from Brooklyn, and they energize the sacred space with rhythms and melodies that could have been heard in this city before the war. It's the music of Ashkenazi (Central European) Jews, familiar to the few elderly remnants of the Jewish population still to be found in Krakow. But this festival boasts a truly eclectic mix of ethnicities, balancing Ashkenazi traditions with Sephardic (Middle Eastern) ones. 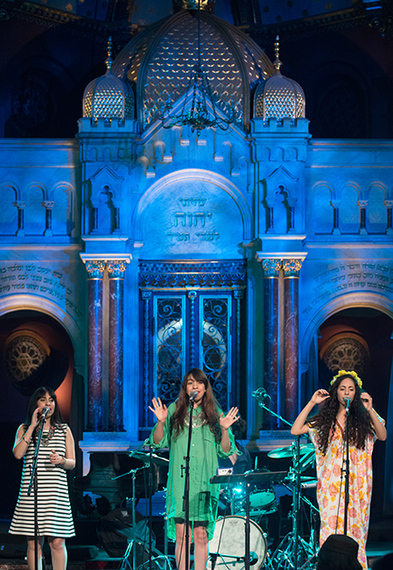 Twenty hours earlier, the performers in the Tempel synagogue were A-Wa, three sisters from Yemen whose songs in Arabic led many of those seated in the pews to jump up and dance. While most were young Polish women, in their midst was a Krakow-born Holocaust survivor, an elderly man gyrating gracefully to the infectious rhythms. This is a different Poland from what I saw in June 1989, just before Solidarity won in the first free Polish elections. For non-Jewish attendees -- who form the bulk of the Krakow Jewish Culture Festival's population -- learning about Polish-Jewish history is simply a joyful process and responsibility. One of the festival events I attended was the humorously titled "Meshugoyim," blending the Yiddish words for "crazy" and "non-Jew." Held at the Jewish Community Center in the heart of the Kazimierz neighborhood, it features the Christian volunteers who keep this JCC going. "I'm the first generation born in a free Poland," says a young woman. "Polish-Jewish relations were cut by the Holocaust and by Communism. My parents didn't have the opportunity to work on Polish-Jewish connection." Another volunteer is a graduate of the local Jagiellonian University with a major in Jewish Studies -- which might seem surprising to people who have often associated Poland with anti-Semitism. "There are many non-Jews among the 200 doing Jewish Studies," she offers. They are part of the thousands of people who fill the square for the closing concert of the festival. "Shalom on Szeroka Street" exudes a pride not only in being Jewish, but embracing the reintegration of its culture and history in Poland, which the Nazis tried to eradicate. "Szeroka" (pronounced Sher-O-kah) means Broad Way, and the crowds in the square rival Times Square on New Years Eve. But they are not waiting for a giant ball to drop, announcing a forward movement in time; rather, the crowd cheers music that is equally about the past and the future. 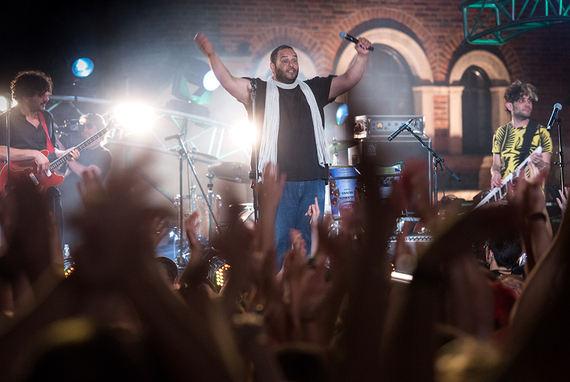 Musicians like Shai Tsabari and the Middle East Groove All-Stars (from Israel) rock the square. The ceremony that follows is a reminder of how this festival is not only about culture but identity, and even faith. Michael Schudrich, the Chief Rabbi of Poland, leads the service of "Havdalah," welcoming the end of Shabbat. The prayers in Hebrew certainly don't elicit the same level of crowd engagement as rollicking Klezmer music, but they introduce non-Jews to the religious source of Jewish tradition. The half-moon over the square seems appropriate to Judaism in Krakow, whose Jews were murdered by the Nazis. Half is visibly lit, while the other half is absent or at least hidden from view. Only 60 kilometers away is the death camp of Auschwitz. The Krakow Jewish Culture Festival is therefore literally and figuratively in the shadow of the Holocaust. 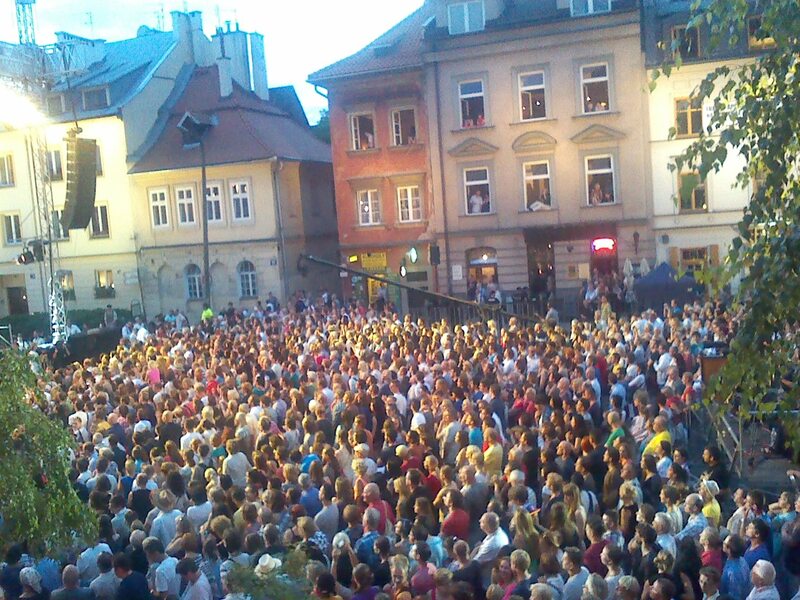 If this event is any indication, Jewish Krakow seems to have risen like a phoenix from the ashes. The person most responsible for this "Rejewvenation" is Janusz Makuch, a multi-lingual creator and organizer of boundless energy. In introducing A-Wa, he invokes the philosophy that animates this unique festival of both commemoration and celebration. "Pluralism is God's will," he says. "We are all equal but -- thank God -- completely different."